A power of attorney document authorizes another to act on your behalf. Almost anyone can be designated as an attorney in fact in a power of attorney, but it’s often wise to consult a Tulsa attorney about Oklahoma power of attorney laws before you give someone else authority to manage your real estate transactions, finances, health care or other personal business. A Tulsa Power of Attorney lawyer at the Wirth Law Office can advise you about various provisions of Oklahoma’s power of attorney law. Contact the Wirth Law Office today if you need a power of attorney for a simple matter like a real estate transaction or a durable power of attorney to guide management of your personal affairs if you become disabled or incapacitated. For a free consultation with an Oklahoma power of attorney lawyer, call the Wirth Law Office now at (918) 879-1681. Power of Attorney: Durable or Not? Oklahoma statutes provide two distinct power of attorney laws. Contract laws in Title 15, Chapter 24 codify a Uniform Statutory Form Power of Attorney Act similar to those adopted by almost every other state. The Act is intended to simplify the procedure for establishing a power of attorney, and to assure those doing business with a designated attorney in fact that the powers are in fact valid. A statutory form power of attorney can be strictly limited to a specific matter, such as handling a real estate transaction while one is out of state, or can be made durable if the right language is included. involving real estate, tangible property, stocks, bonds, commodities, options, banking or other financial and business matters. The powers may authorize an attorney in fact to represent the principal in resolving claims or litigation, handling personal or family financial matters, making decisions about government benefits such as Social Security, Medicaid, Medicare or military benefits, managing retirement plans or taking care of tax matters. A second type of power of attorney is described in laws that detail Oklahoma probate procedures. The Uniform Durable Power of Attorney Act allows principals broad latitude to define terms under which a power of attorney may spring into action or be terminated. 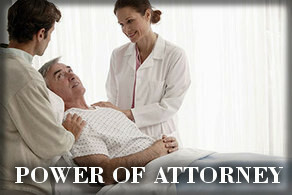 For that reason, durable powers of attorney are somtimes called a springing power of attorney. Will the Bank Honor My Power of Attorney? Although durable powers of attorney are intended by statute to ease concerns about validity or adequacy of the execution of a power of attorney, the document doesn’t always satisfy the concerns of some who are presented an instrument authorizing someone else to make decisions in your behalf. An experienced Tulsa attorney can help you find the assurance that your document will be honored, and represent you if it’s not. Such durable power of attorney documents are often constructed to give someone you trust authority to handle your personal affairs if you are disabled, but who decides when you are disabled? A well-written durable power of attorney might rely on a doctor’s written verification, but a doctor might be reluctant to sign such a sweeping authorization. One reason doctors may hesitate to sign a verification is because the Health Informaton Privacy Protection Act (HIPPA) requires health-care workers to keep patient records secret. To sign a legal document disclosing your status as incapacitated might violate that federal law. An Oklahoma power of attorney lawyer can help you craft language that will grant a doctor the narrow authority needed to balance the conflicting interests of privacy and disclosure. Why Prepare a Durable Power of Attorney? Durable powers can be included in statutory forms of power of attorney simply to assure that your authorized agent can continue to handle business if you are incapacitated. In probate and estate planning, durable powers of attorney can provide a cost-saving alternative to letting a court decide who will take over if you or a loved one is no longer able to handle personal, financial or health-care decisions. When a person is incapacitated and isn’t prepared, courts can conduct guardianship hearings to appoint someone — even someone they”ve never met — as a guardian. The cost of the hearings is typically charged to the incapacitated person’s estate. For that reason, and to be sure the one appointed to handle those important matters is someone who understands your wishes, it’s often best to prepare a document in advance with the help of a Tulsa power of attorney lawyer. If you would like a free consultation with a Tulsa Oklahoma lawyer about statuory form power of attorney, durable power of attorney or related instruments, call the Wirth Law Office at (918) 879-1681 (or toll free at (888) Wirth-Law) or submit the question form at the top right of this page.